Our second Fiat of the day isn't quite as compact, and with regular gasoline engines it isn't as green, but it could be significantly more important for Fiat in the U.S. The 2014 Fiat 500L makes its official debut at the 2012 Los Angeles Auto Show, presenting Fiat with a rival to the MINI Cooper Countryman, Kia Soul, Nissan Juke and Subaru XV Crosstrek. The 'L' stands for 'Large', and as the name implies the 500L is rather bigger than the dinky, retro 500. It may look similar to the regular 500, but while the exterior dimensions are firmly in the subcompact class, its interior space has been maximized, enough for the EPA to consider it a full-sized car. Based on the European Fiat Punto hatchback platform, the 500L gets a 1.4-liter turbocharged MultiAir four-cylinder. This produces 160 horsepower and 184 lb-ft of torque, through either a six-speed dual-clutch transmission, or a six-speed manual. Two trim levels will be available, Touring and Trekking. The Trekking is the rough-and-ready off-road inspired model you see in our images, though unlike some rivals the 500L doesn't yet have an all-wheel drive option. The Touring is a more subtle affair. No EPA-rated mileage figures have yet been revealed--but we can expect these soon, with pricing to be revealed later. The 2014 Fiat 500L goes on sale next Summer. 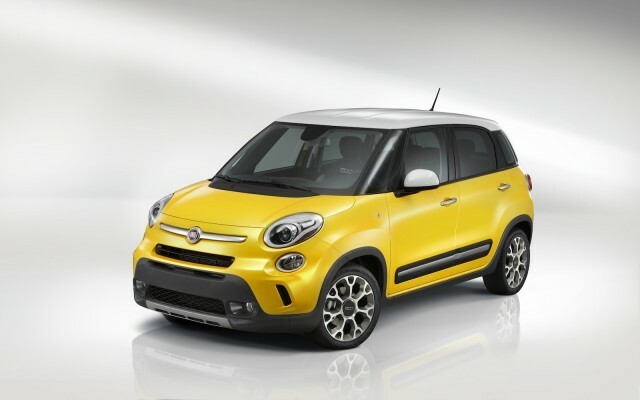 For more information on the 500L, head over to our sister site, TheCarConnection. You can also follow more news from the L.A. Auto Show on our dedicated show page.